The spirited exchanges between the hero and the villain are a treat, and the atmosphere is great, but what makes this movie special is the demon. It is a truly memorable addition to cinema's museum of monsters. What gets me about this movie is what happens if the target of the demon is in a very public, very crowded place at the time. I mean, is this thing going to casually appear in front of 5,000 soccer fans at a match? Also, what if the target is in some small, deep cave where there's no room for the demon to manifest? is it going to sit and wait there, hours, days, etc? This is one of my all time favorite monster movies, I watch it at least once a year. Sam Raimi's recent Drag Me To Hell of course owes an immense debt to this one, but I do not see it as a rip off instead more as a homage. The demon itself is very menacing, but any number of horror film history books will deride its inclusion in the film as unnecessary. 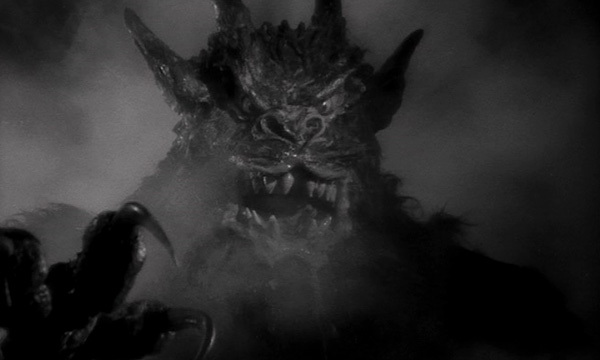 Apparently the shots featuring the demon were filmed later and included on the demand of the producer whereas the director Jacques Tournier wanted it left more up to the viewers imagination. Either scenario would have worked well in my opinion, and I agree with Andrew this is one awesome movie monster! I enjoyed this movie greatly when I saw it at our local college's film series many years ago. It's based on a short story, "Casting the Runes" by M.R. James, who wrote more consistently scary ghost stories then anyone since Ambrose Bierce. Either I'm doing something wrong, or the soundtrack clip is missing (or mislinked)... when I click on that link I get an error page saying the file I'm looking for doesn't exist. From Andrew: Sorry, my mistake. That link should not have been present. I remember this movie from the 8mm reels I saw as a child. I don't know where they are now, but that Demon is one a youngster does not soon forget. I can remember that image of the demon you have included in your screen shots. Each time my brothers would want to set up the projector and watch movies, I would cry, not the monster one. I will definitly seek out this one for my Bad Movie collection. This is a very good to great horror movie. I am shocked that Andrew hasn't gotten any outraged complaints yet: "How dare you put this classic on a site devoted to bad movies!" People should be warned off watching the edited version of this movie, titled CURSE OF THE DEMON. It's available on the flip side of at least one of the DVD releases of the movie, but should not be watched by accident unless you're looking to compare differences between the edited and the full version. Since Monster Jungle X-Ray has already talked about the monster in the film, let's talk about the mood. This is one of the best movies I've ever seen for establishing the mood, and it establishes it right at the beginning, as you know something is wrong, you just don't what. In establishing mood, it also helps that the film is shot in black-and-white. (IMHO) it'd be alot less moody movie, if the film was shot in color. I feel this is one of the very best horror films of the 1950s IMO. In a decade dominated by Science Fiction style horrors and terrors, this film seems more of a return to a more traditional style of Horror story and it's done very effectively I think. Very spooky and creepy and holds up surprisingly well. The thought that it would wait for the doomed person to emerge is very much in the spirit of the creature. I'd also guess that the cave might suddenly fill with fire and brimstone, or perhaps just a claw would reach out of the netherworld to execute the death sentence. Hopefully, those who had the initial reaction read the review and understood that I love the movie, and feel that it is a very well-executed effort. It is also possible that the people who would remark that way are also the types who do not watch many B&W films. I probably saw this movie on Channel 29's Creature Double Feature sometime around 1980. The Demon's otherworldly visage stuck with me through these many years. Simple by today's standards, but incredibly effective. What many CGI artists do not quite get is that special effects do not have to look perfectly real. They need draw the viewer into the story. If you've ever seen a good production of "A Midsummer Night's Dream" or a well-done performance of "The Nutcraker," you know what I mean. The sets and costumes don't have to look like real life. They have to look like they belong to the story, and the viewer has to want to be part of that story - to live in it for a little while. Then everything clicks. If the movie makes any mistake, I think it's that it shows the demon too soon. It should not be seen in the first murder, but be the payoff at the end. It's still a very effective demon. And why not review a well-made movie here once in a while? I'm sure it's like a breath of fresh air for Andrew. One should not take the "Bad" too seriously. I got the impression that no one but the intended victim can see the demon. Also, that the deaths appear to accidental (or at least the ones we see. The first is death by electrocution and ther second by being run over by a train). As for hiding somewhere small, perahps the demon can reduce it's size or kill you in some other fashion other than direct attack? There are only three theatrical films that heavily feature the game of Snakes 'n' Ladders. Two of them are reviewed at this site. This is one of them. The other is "Lair of the White Worm." And the third theatrical film to heavily feature the game is "The Golden Fortress" from 1974. Several points are worth making here. Firstly, director Jacques Toureur, who took his name off the film in disgust at studio interference, apparently wanted the demon to be much less explicit. He intended for it not to appear at all at the beginning, and to be glimpsed subliminally during the final scene so that the viewers wouldn't be quite sure what they'd seen, or even whether they'd seen it at all. If anybody fancies making a "Director's Cut" on their PC, all they have to do is remove every shot of the demon, except for one-fifth of a second at the very end (the director specified that it should appear on exactly five frames of film). The music will skip a bit, but you'll be seeing what the director wanted you to. Also, I'm surprised that no mention is made in this review of my favourite scene, in which Karswell, who by way of camouflaging his true nature has charitably thrown a kiddies' party at his mansion, and is entertaining the little 'uns with magic of the rabbit-out-of-a-hat variety, is suddenly confronted by the hero, who by now suspects that something is very badly wrong. Karswell seamlessly shifts gear from jolly children's entertainer to genuine magus and freaks out all concerned - especially the kiddies - by summoning a violent storm out of nowhere. And the great thing is, he plays the scene in full clown make-up! Is this the very first true Evil Clown Movie? Talking of which, anyone familiar with "The Last Of The Summer Wine", the world's longest-running sitcom - it finally ended a couple of weeks ago after a run of 37 years (basically because almost the entire cast were dead, along with, one suspects, most of the audience) - will be familiar with Brian Wilde, who played lovable old fool "Foggy" Dewhurst for most of that time. Watch out for him in this film - he's the Satanist who screws up so badly that Karswell sics the demon on him too, ultimately causing him to dive through a high window rather than let it catch up with him (yet another indirect death caused by a demon whose very existence the director intended to be ambiguous). Finally, I think it's worth pointing out that "The Night Of The Eagle" (1962), delightfully known in the USA as "Burn, Witch, Burn! ", is basically this film remade as a true Bad Movie, sort of like an episode of "Bewitched" directed by a very, very young David Lynch. Personally I think it's involuntarily hilarious, and far worthier of inclusion on a bad movie website than Tourneur's flawed but excellent film. Anyone fancy reviewing it?